Movie Review: Al Pacino is A.J. 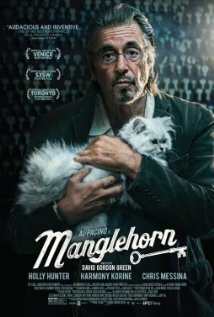 Manglehorn, an aging Texan locksmith who lives embittered in the company of his old cat since he let go the love of his life, Clara, many years ago. Instead, he got married to another woman with whom he had a son, a super-occupied, money-focused businessman. Manglehorn keeps addressing letters of love to Clara, expecting something to happen besides his usual routines, which consist in working, occasionally taking his granddaughter for an ice cream, playing slot machines while listening to the smooth-talk of his friend Gary, and flirting with Dawn (Holly Hunter), a gentle bank teller who is super excited to go out on a date with him. All at once, everything seems to collapse: the cat needs surgery after swallowing a key, Gary no longer has his trust after a ludicrous episode, his son asks him for money to financially rescue his company, and the date with Dawn goes wrong, triggering a soapy scene that sustains a melancholy that kept on growing. I suddenly became somnolent and discouraged, unable to find a way to connect with the characters. This time around, the lucid director, David Gordon Green (“George Washington”, “Joe”), didn’t have the ability to pick out Paul Logan’s primitively faint story and turn it inside out, giving it the right temper to entangle us. Actually, the only vivid things in the film are its colors because the rest lingers indefinitely in shabby tones, now and then interrupted by unreasonable incidents (even a musical one) and incongruous dreamy sequences. Acting in accordance with the title character, who confesses he's losing hope in tomorrow, I also felt the same hopelessness and indifference in relation to “Manglehorn”. Mr. Pacino’s voice was aggravating at times, and even he, so talented and committed, never balanced anger and love in a categorical way.